BYU gymnast deftly—and deafly—tackles the uneven bars. 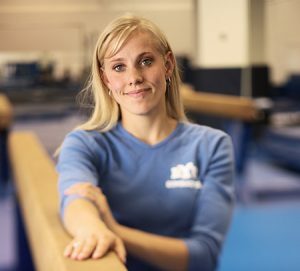 When she was 7, Aimee Walker (’08) decided to be a gymnast. After watching her cousins compete one day, she asked her mom, “Can I do it? It looks really easy, and I do flips on the couch all the time.” Her mother agreed and called the gym. Yes, they were accepting new students. Yes, they had classes for 7-year-olds. Then Aimee’s mom said, “Oh, she’s deaf, and she’s blind in one eye. Is that a problem?” Yes, it was. No one at the gym knew sign language, and they had to turn her down. Hour after hour, year after year, Aimee trained herself to be a haptic gymnast—to feel her way through the complicated maneuvers rather than use her eyes. By the year 2000 she’d reached the distinguished status of international elite. She was invited to start training for the Olympics but was unable to join the team because of injuries. After high school, Aimee joined the gymnastics team at UCLA, near her hometown of Valley Village, Calif. The team won the national championship her freshman year, but the school’s deaf program didn’t provide the academic support she desired. She transferred to BYU in 2005.